I think Millie, our dog, is Jewish. She enjoys challah, the Shabbat bread, and rugelach, a traditional Ashkenazic Jewish pastry. I discovered her fondness for rugelach after I’d baked a batch for my dear friend Carrie, to celebrate her son’s baptism. Carrie and I are both Catholic with non-Catholic husbands, and we have interesting conversations about faith. The day before the baptism the best-looking cookies sat on a platter, wrapped in plastic, on our dining room table. Not giving the table-to-dog height ratio a second thought, Mike and I went out to dinner. When we returned, the plastic wrap had been peeled off, about four cookies remained, and Millie stood in the hallway guiltily licking crumbs from her nose. Fortunately, the other half of the batch had been packed safely in a tin, so those were the cookies that made it to the baptism. Rugelach are not for the faint of heart, or those who cannot abide a chaotic kitchen. They require a serious commitment of time, employ various baking techniques and appliances, and will create a gigantic mess on your counter tops. In the end, though, they are worth it. This batch is intended for Carrie and her family, who I hope can make it to Pittsburgh tomorrow for Memorial Day. You will also need powdered sugar for rolling and sprinkling on the cookies. In a medium bowl, combine flour and salt; set aside. In a mixing bowl, combine butter, cream cheese, lemon zest, and vanilla and beat until light and fluffy. Add flour mixture and beat until well combined. You may need to knead your dough very slightly to get all of the bits of flour at the bottom of your mixing bowl to incorporate it fully. Divide dough in half, shape into balls, then flatten into discs. Wrap in plastic and chill for 1 1/2 hours, until firm but not hard. In a food processor, combine preserves, honey, and cinnamon and pulse a few times until smooth. Add pecans and process until coarsely ground. Transfer filling to a large, four-cup glass measuring cup so you’re able to divide it evenly among the dough. You should have about two cups of filling. Sprinkle a clean counter top heavily with powdered sugar. Roll one disc of dough into a 12-inch circle – don’t worry if it’s not completely round. Dust with more powdered sugar and turn frequently to ensure the dough doesn’t stick to the counter. Spread half of the filling over the circle to within one-quarter inch of the edge. Using a pizza cutter, cut dough into quarters, then cut each quarter into five or six wedges, depending on the size of the quarter. Your wedges do not have to be perfectly uniform in size; if I have some that are larger than others, I bake the larger ones toward the back of the oven, because my oven is hotter in the back. Beginning with the outer edge, firmly roll up each wedge and place on a prepared baking sheet, then dust generously with powdered sugar. Bake for 18-21 minutes, until lightly golden brown on the top. You know you are loved whenever a friend bakes something for you. 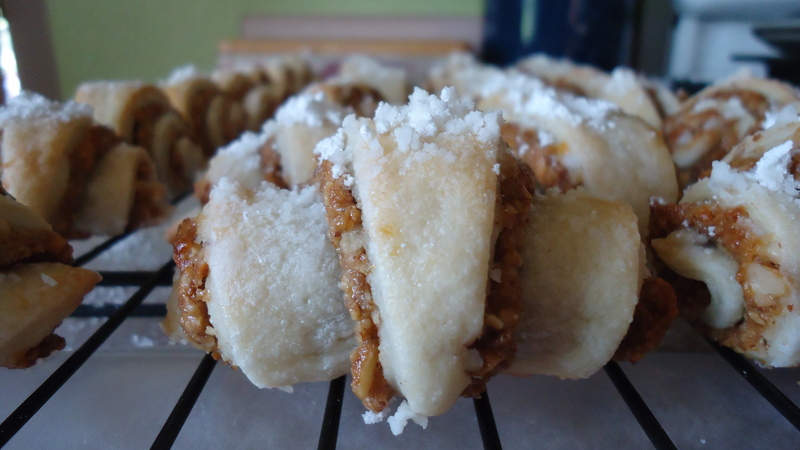 And pecan rugelach in the heat! Well, I feel very special. Thank you, Amy.